As the Detroit Red Wings approach the end of the 2015-16 NHL season, they sit in third place in the Atlantic Division with 91 points—one ahead of rival Boston. And with a wild card spot likely out of the picture, the Red Wings will need to cling to that ranking down the stretch in order to reach the playoffs for an unprecedented 25th consecutive season. Detroit “clings” to a playoff spot, in part, because of their transition away from their defining puck possession game. 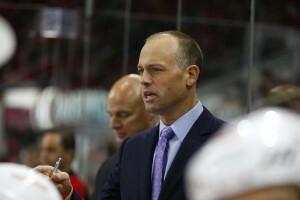 Since Scotty Bowman took over the Red Wings’ bench in 1993, the Red Wings’ mantra has always been about the puck possession style, even after Dave Lewis and Mike Babcock took over. Now, in Jeff Blashill’s first season at the helm, the Red Wings find themselves without an identity. As previously stated in another article, the Red Wings are no longer a puck possession team. Detroit’s current approach to collecting the puck, breaking it out, attacking through the neutral zone, and generating offense in their opponents’ zone is not reflective of a prototypical possession-style team. Whether they were collecting the puck in defensive zone or joining the attacking rush, most Red Wings’ defensemen have been slow this season. Niklas Kronwall has been hobbled by injuries this season, Jonathan Ericsson has a chronic hip condition, and Kyle Quincey was never the fleetest of foot. Those three barely jumped up on the rush this season. As for the defensive zone, Detroit’s set strategy was to approach the unclaimed puck slowly and protect from forecheckers, regardless of the pressure level. Winging It In Motown’s Prashanth Iyer explained their defensive zone breakout strategy in detail in a recent article. During the Red Wings’ recent dominant era (2007-2011), their offensive strategy was to involve the defense as much as possible, often creating odd man rushes and scoring opportunities. And when their opponents gained possession of the puck, all five skaters came back and played sound, defensive hockey. This meant a lot of skating, especially for the defensemen. Nicklas Lidstrom was the master of this style of play, but Brian Rafalski, Niklas Kronwall, Brett Lebda, and to a lesser extent, Brad Stuart, consistently joined the forwards on rushes to put additional pressure on their opponents’ defense. Detroit’s current team does not jump up as well as past teams. Brendan Smith, Mike Green, and even Danny DeKeyser do join the rush, but the Red Wings’ strategy is to have a more passive approach from their defensemen. To resolve this, Blashill needs to give his defensemen the green light more often. Looking ahead to next season, Kronwall should be 100% and Alexey Marchenko will have more experience and confidence to make plays. Ericsson could opt to jump, but an Andreas Lilja-type role would suit him best. 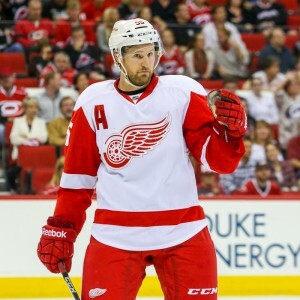 Perhaps the Red Wings will acquire an offensive defenseman over the summer as well. Regardless, it all starts with Blashill giving his defensemen the green light. That, and an understanding from the entire team that awareness to cover for the jumping defenseman is absolutely critical to success. When the Red Wings enter the offensive zone, they do a good job moving the puck around the perimeter, especially along the sideboards and point. What they don’t do so well is work the puck to the slot for high-danger chance. If the Red Wings can possess the puck in the slot, they’ll likely have a strong scoring opportunity coming from a shot or the ability to move the puck off to the side for an open look. The two issues separating this dream from becoming a reality are the lack of size up front and the inability to quickly move the puck. Justin Abdelkader presents the only real option of a forward who can fend off defenders with his size and get a shot off, but he’s usually parked in front of the net. The latter issue will likely be resolved sooner though. Detroit already passes the puck well in the offensive zone, they just need to do so quicker. By giving the defense less time to react and moving into open territory, they can easily create offense with their current team. This also gives the Red Wings’ opportunity to enter the slot, since they won’t be stationed there long before shooting or passing. It’s hard to improve the speed of your team at the NHL level, but the Red Wings can improve based on the skill sets their current players have. While slowing down or delaying can open opportunities, playing at a quicker rate, then delaying is far more dangerous. Just ask Pavel Datsyuk. While the Red Wings are no longer excelling at the puck possession game, they are not that far off from effectively returning to their former forte. More mobile defensemen, stronger and faster forwards, and a complex team strategy are on the wish list for all NHL teams each season, so adding the former two may be difficult. But improving the X’s and O’s is not a big ask, especially with the brainstorming time of an offseason. And if adding additional players is indeed out of the question, at least the Red Wings have a solid core of young, talented players to build a winner. In their quest for a 25th consecutive playoff appearance, the Red Wings’ magic number is 6 with three games remaining in the season. This number can be decreased by points gained by the Red Wings or points missed out on by the Bruins. Boston hosts Carolina Tuesday night in Detroit’s first attempt to decrease the magic number. As if the drama wasn’t high enough with a playoff race, some reports came out over the weekend that Pavel Datsyuk may leave for Russia following the season. When asked, Datsyuk wouldn’t confirm nor deny the rumors. With this said, do not read into the rumors too much. 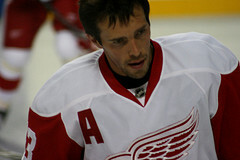 Datsyuk is a proud, honorable person. He does want to play in Russia before his career is over, but likely not until his contract is up in Detroit. It would take a lot for Datsyuk to leave Detroit with a year left on his contract and put the Red Wings in an awkward cap crunch.